Arette IA – John's Cameras. This is a nicely designed and made camera aimed at the lower end of the enthusiast market. It is not a point and shoot – it is necessary to set both shutter speed and aperture and focus the lens – but the lens cannot be exchanged and there is no light meter or rangefinder. The camera is made from die cast aluminium with a satin finish stainless steel top and bottom plate. 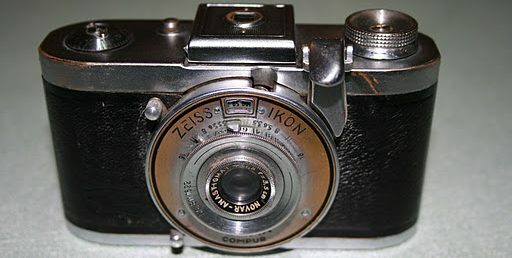 The camera measures 125 by 85 by 65 mm and weighs x g.
The lens is a Color-Isconar made by Isco-Göttingen (which is a division of Schneider-Kreuznach). On the top plate, at the right hand end, is a memo for film speed (in both ASA and DIN) and film type (colour positive, colour negative or monochrome). Film speed is set on a dial on the top. The film type is set by a wheel on the right hand edge and the film type is viewed through a window. Both these devices are entirely mnemonic and have no effect on the operation of the camera. This memo is on a raised portion which is reflected on the other end. This left hand raised portion contains the film rewind knob and a recessed lever to raise the knob. The rewind knob is raised by a small lever on the inside of the raised portion. Between these two – and not quite centrally for some reason – is an accessory shoe. At the this age, the most likely use for this would have been for an accessory rangefinder. There are no electrical contacts so this is a cold shoe. On the back of the top plate is the viewfinder eyepiece. This is round and measures ten millimetres across. This is generously large for the time and is useable while wearing my glasses. When looking through the viewfinder, there are clear bright-lines for framing the picture with dotted lines to (at least partially) overcome paralax between the viewfinder and lens when taking close-up pictures. Completely missing from the top plate is the film advance lever – more later. On the front of the top plate, at the right when using the camera, is the camera name (Arette IA) in green ‘handwriting’. On the left is the viewfinder window. At first sight, this looks like an elongated window. In fact, it is two windows – the viewfinder window proper and a second, translucent, window to provide illumination for the bright-lines. Available apertures are a quite usable f/2.8 to f/16. As always, the front of the camera is dominated by the shutter/lens assembly. This is central (unlike the accessory shoe) and sits in a decorative stainless steel fascia. The shutter is a Prontor SVS shutter made by the company that used to be called Gauthier but was now called Prontor after their most successful shutter model. The S in SVS refers to the fact that the shutter is synchronised for flash and the V (for Vorlaufwerk) indicates a self-time function. Prontor shutters came in two flavours – unlinked shutter and aperture or linked shutter and aperture. This camera has the linked shutter and aperture known as the EV system. EV stands for Exposure Value. When using a suitable light meter (and most light meters were suitable in the 1950s) you could read off the EV from the light meter and set this value on the shutter. For example, good sun light will have an EV of 15 (f/16 @ 1/100 seconds if you use the Sunny 16 rule). Having set this, you can alter the shutter speed to 1/300 seconds and the aperture will alter itself to half-way between f/8 and f/11 so maintaining the correct exposure without the user having to think about it. The shutter can only be set to click-stop speeds while the aperture will set itself to the precise aperture needed (as in the above example). This is because the shutter will not work with in-between settings but the aperture will. Available EV values are from 2 to 17. EV 2 is 2 seconds @ f/2.8 and EV 17 is 1/300 seconds @ /16. There is a range of shutter speeds in green that cannot be set. So, for instance, at EV 4 you can have either 1/2 second @ f/2.8 or 1 second @ f/4. If you want a smaller aperture, say f/11, you can read off the green shutter speed against f/11 (which is 8 seconds). You then set the EV value so that f/11 is against B (which is EV6) and then manually time an eight second exposure using a cable release. This is a good German camera and copes with light by the back having large flanges that fit into deep recesses – there are no foam light seals here. Available apertures are a quite usable f/2.8 to f/16. The shutter release is a large knurled lever on the top right of the shutter housing. On my camera, the shutter will not fire. I think that this is because the film advance lever is not cocking the shutter. Also on the rear of the shutter housing is a threaded socket for a standard cable release on the top left. Half way down on the left is a PC socket for a flash gun. This can be synched for flash bulbs (M) or electronic flash (X). The selector for the two flash synch modes is on the right of the shutter housing below the shutter release lever. This synch selector also has a V setting for the self-timer. The lens is a Color-Isconar made by Isco-Göttingen (which is a division of Schneider-Kreuznach). This has a focal length of 45 mm which is normal for 35mm photography (‘normal’ means that it produces the same angle of view as the human eye). I am fairly confident that this is a triplet lens and it is clearly colour corrected. It is also coated on all surfaces. The base of the camera holds the missing film advance lever. This is on the right and is easily accessible to the user’s right thumb. As mentioned above, this is not cocking the shutter and does not feel ‘right’ when used. In the middle of the base is a frame counter which counts up from zero and must be reset to `zero when a new film is loaded. On the other end of the base is a tripod socket. This is the standard 1/4 inch Whitworth (or UNC – I am not sure when the standard changed from Whitworth to UNC). The back is opened by squeezing two studs on the left hand edge. This is a good German camera and copes with light by the back having large flanges that fit into deep recesses – there are no foam light seals here. Inside, the camera is much like any other 35 mm camera.The main difference is the absence of a sprocket shaft and the presence of two sprocket wheels – one above and one below the film gate. The sprocket wheels are necessary to measure how much film has been advanced. These sprocket wheels should free-wheel backwards to allow the film to be rewound but these will not. I am sure that this will be connected to the problem with the film advance lever not cocking the shutter. There is some evidence that someone has attempted to dismantle the camera at some point, presumably to sort this out. Or maybe they caused the problem by fiddling. The take-up spool is very thin – this will bend the film more than usual and will be likely to make it difficult to store the negatives flat. Because of these problems, I shall not be able to test this camera with film. Thanks for a really good review! It’s a fine looking camera and such a pity that it isn’t working. I seem to be running a theme at the moment – most of the cameras I have bought recently have not been usable. One of the joys of distance buying.